The picture above says it all. Team work, camaraderie spirit, muddy paws and boots. Close to pulling my arm out of the socket, Colin was extremely agitated at the starting point. As we set off walking he eventually began to calm down. 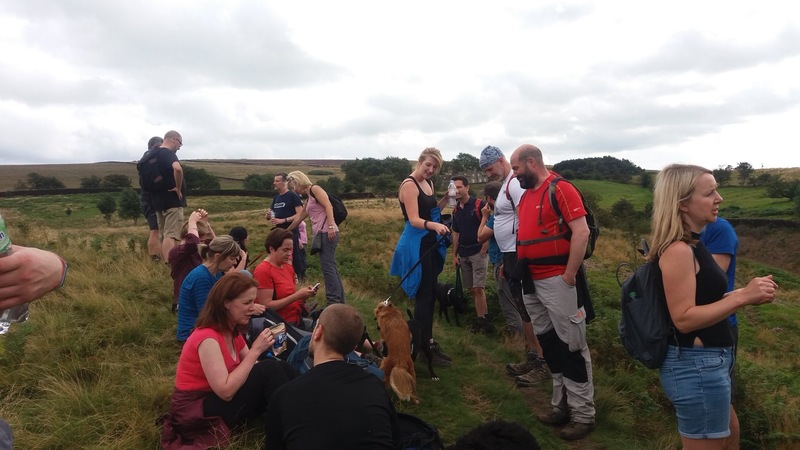 To start our walk our 25 strong team took a short climb up a wooded bank from Disley Station and ambled for half-a-mile before entering Lyme Park through Park Gate before ascending up Cage Hill, which is topped by a magnificent tower known as The Cage. Within minutes everyone was chatting as if they had known each other for years. Walking and talking side by side is non-confrontational, making it easy to hold a comfortable conversation. During our afternoon walk, we admired many stunning views including; Elmerhurst Wood, Gritstone Trail, Knightslow Wood, the Fallow Deer enclosure to the Hall, and the Saxon Bow Stone. We came across many stiles, including ladder stiles. I didn’t think Colin would follow me up the ladders. It’s taken him 2 years to learn the Give Paw Trick! Thank goodness for James Alcock from Dice Ltd who helped me carry Colin over several stiles. The most powerful outcomes were that walking in a casual non-business environment broke down barriers straight away and made people feel at ease. In addition to pushing oneself to better fitness physically, it certainly helped me move out of my comfort zone to gain greater clarity and connections. Plus we can all do with a bit of mobile and laptops rest bite from time to time. Walking meetings are much more natural and relaxed. Roger Longden from There be Giants. We were getting closer to the finish line, we were walking along Green Lane my Colin decided to perform what’s best described as a ‘bambi on ice’ position on the ground. Spread-eagled on the ground this Corgi was not for moving. At this stage, it looked as if I had to drag him. Even though the group found this act of stubbornness amusing they were concerned about my extremely exhausted little pooch. If it wasn’t for Roger Longden from There be Giants, I would have been scratching my head trying to figure out how to move my Corgi to the finish line at the Rams Head in Disley. The hero of the hour was Roger, he picked him up and placed him over his shoulder carrying him some fair distance back into town. Word got round to those ahead of us, Clare Coyne from CAM Communication was offering to drive up to where Colin had given up to rescue him. Thankfully it didn’t come to that. Instead Roger’s flawless white t-shirt was getting caked in muddy paw prints! Back at the Rams Head I made sure to buy Roger and James a refreshing pint of Doomsday. 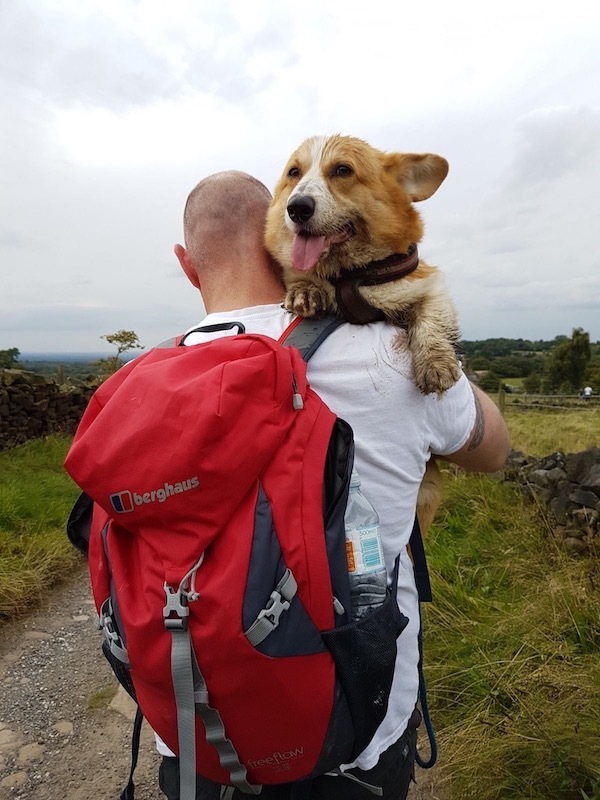 Freshwalks brings all kinds of people together. It’s a fantastic chance to network outside of stuffy meeting rooms. No out-dated pushy sales pitches or referral targets… just walking boots and good conversations. Great day, met some wonderful people. Looking forward to the next meeting, as for Colin’s attendance – I must give that a rain check. Cezara Glynn is Marketing Manager for Woodbank Office Solutions. Based in Stockport, Cezara has introduced new, innovative communication channels to raise Woodbank’s profile through brand development to internal and external audiences. You can follow Cezara on Twitter @CezWoodbank or connect with her on Linked In here.